Every shorebird has a specific feeding behavior that can be explained by the body and bill size and shape. Knowing how shorebirds feed can give you a clue when trying to identify shorebirds. It can also give you an insight into the birds’ lives. Every bird is built specifically for the way that they feed. 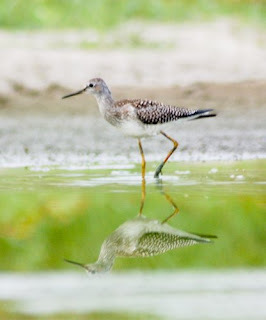 The Yellowlegs: The Yellowlegs both forage more commonly while wading in the water. They are very energetic feeders, often running around and trying to kick-up anything from small fish to aquatic bugs. Pectoral Sandpiper: The Pectoral is a more variable forager than either the yellowlegs or the peeps in certain aspects. It will feed anywhere from the edge of mudflats into the water. It is a very methodical forager probing the mud for insects. For the most part you can predict which shorebirds will feed in which areas. The overall trend is that the larger the shorebird the deeper they will forage in the water.